Rogue Ales, a microbrewery in Newport, Oregon, has made a reputation for itself in the world of the micro brew for making their beer in the traditional cask-conditioned style, which means allowing the live yeast to ferment the beer and create carbonation naturally as opposed to the filtered, pasteurized, gas-pressured keg method most often used today. Tomorrow and Wednesday, May 4-5, Rogue is bringing 31 of their thoughtfully prepared brews to the Blind Tiger on Bleecker Street for the annual Pacific Northwest Celebration, which has been taking place for over 12 years (since the Tiger was on Hudson Street). 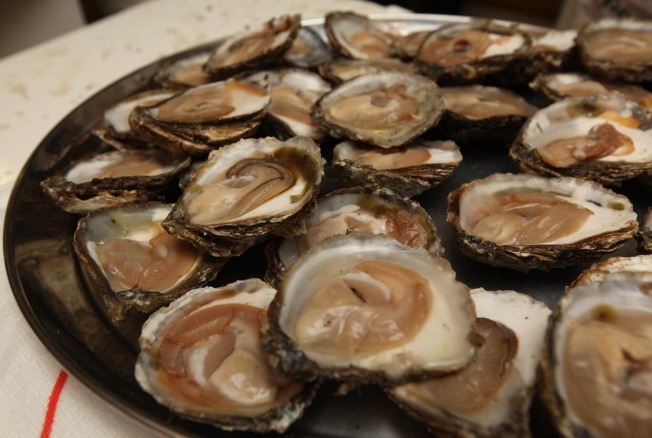 Beer may not be the first thing you think to pair with oysters, but oysters and stout have been a popular combination in Britain for a long time. Lucy Saunders, author of "The Best of American Beer & Food" recently told the Washington Postthat "depending on the method of cooking or garnishing, oysters can be sublime with stout because the dark-roasted malts provide a toasted sweetness to offset the brininess of the oyster." Buhler says they will have several stouts on tap that fit the bill: The Shakespeare Stout, Chocolate Stout (made with real bittersweet chocolate) and the Double Mocha Porter. Alan Jestice, a partner at the Tiger, recommends the Brutal Bitter, which "has big hoppy citrus flavors that activate the palette and create a third flavor beyond beer and bivalve." If the dark stuff isn't for you, Buhler recommends the John John Juniper, a pale ale made with juniper berries and aged in the Rogue Spirits Spruce Gin Barrels: "The piney, spruce and hop notes in the beer will pair beautifully with the saltiness and brine of the oysters." Clearly, you will have plenty of choices.